In the North, which for us who live here, includes all of the northern and Scandinavian countries, there is a tradition that has been such a natural part of our culture, that no-one has noticed that it is being forgotten. I got the idea for this article when I remembered how, as a child, I was asked to sit still while the sun set and it grew dark. In the northern countries, the twilight is considerably longer than in the south. At the equator the sun goes down in a matter of minutes, whereas in the North, depending on the time of year, it can last much longer than an hour. In my family, we called it just that, the twilight hour. Occasionally, I sat together with my mother and experienced the day fading, but when I visited my aunt it was quite consistent every time, no lights were lit, no radio, no talking, we just sat and experienced the darkness falling. When it was almost dark in my aunt’s apartment, a man would come by on the street outside, Gammeltoftsgade in Copenhagen, where she lived opposite the county hospital. With a long pole, he would pull a small ring on the gas lamp outside the window so that its pilot light blazed up and lit the whole lamp – and so the dusk was over for us, and the evening began with all of its activities – mealtime, company, radio, etc..
A few years ago, when the memory of the twilight hour came back to me, I began asking my students, especially those in the Scandinavian countries, if they knew of this custom – and what they did in this period. I found that between 10-20% of them either remembered the twilight hour from home or still used it. The further north one goes, in the northern part of Scandinavia and in Finland, the better it is remembered and still used. But also in the most southern end, Denmark, a strong tradition is still present. We have received some accounts of the “blue hour” from Germany and would like to hear more, and I would be grateful if people from Holland, England, Scotland, Ireland, Canada, Greenland, Chile, Tasmania and New Zealand, as well as others and hopefully more from the north, could tell us writers and readers, if they know of what we are describing here. In the North, there is a big difference between summer and winter. In Denmark, we have the “light nights” for a large part of the summer, where it never really gets dark. And the further north one goes in summer, the lighter it is at night. In the northern parts of Sweden, Norway and Finland, and in Iceland and Greenland, the sun does not go down at all for a part of summer, but moves close to the horizon at night. In the middle of winter, on the other hand, it gets light late and dark early. In Denmark, dusk occurs in the middle of the afternoon in December and January. But for the rest of winter, spring and autumn dusk happens late in the afternoon, when many can make use of it. At the equator, Singapore for example, the sun rises and sets at more or less the same time every day, year round, and it happens disappointingly fast for a northerner – it is, though, possible to experience a relatively short dusk, of a few minutes, at the equator – that is, if one does not have an errand in a shop while it is still light – five minutes later, when one comes out, it is pitch-dark, apart from the street lights. 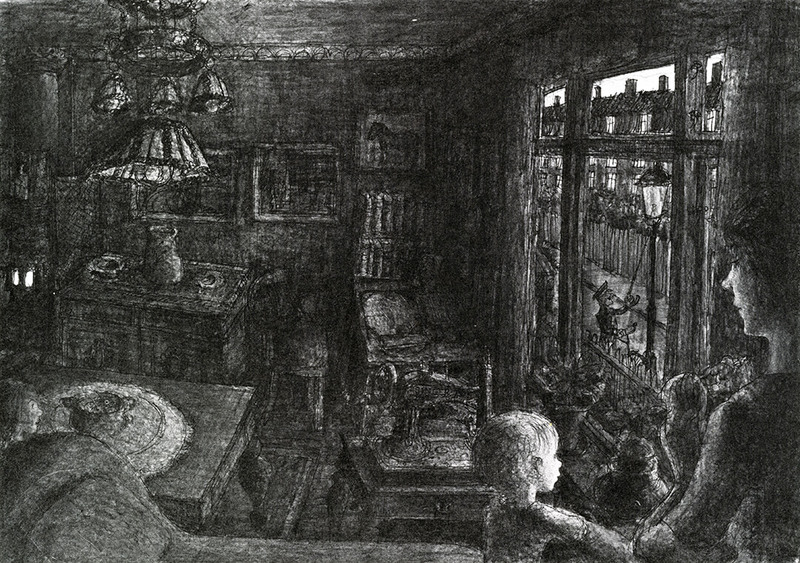 “In my childhood home, it was a natural thing that we often – although not every day – ceased our activities and sat and watched the darkness fall. We used two kinds of ‘blue hour’, a winter version and a summer version. One for the winter afternoons inside, in the sitting room – I remember some beautiful sunsets out of our sitting room window. We didn’t have a television and I doubt that there was anything on in the afternoon back then in the early sixties. In the afternoons, my mother would iron clothes or else work with her wood-cuttings and sometimes I would listen to children’s hour, on the radio. After children’s hour, I think there was just the latest shipping forecast, so we turned the radio off and sat still until it was completely dark. Afterwards, we turned the light on, and started preparing the evening meal. My grandmother visited every Wednesday afternoon. She was otherwise a talkative and active woman, but the blue hour would make her more subdued. If the adults talked a little, it would be a quiet philosophical conversation on the deeper things of life. In the semi darkness, recollections and realizations came forth. We could not see each other’s faces clearly in the blue half-light and that feeling of togetherness and peace one had, made us far more tolerant towards each other. When my grandmother grew old, she used to enjoy sitting in her favourite chair, letting the darkness descend, at least when I visited her. In spring and autumn, we children would play outside after the evening meal. I remember coming boisterously into the sitting room when my parents sat silently in the dusk. It wasn’t popular that one disturbed, also not at friends’ homes when their parents sat like that. The summer dusk consisted of the family taking an evening stroll in the woods, over the marshes, by the swaying corn fields or along the beach. When the sunlight faded, everything took on an enchanted glow and the other senses became sharper when one could not rely upon the sight. We were completely silent. ‘I am here to experience nature, not to listen to you’, we were told if anyone dared to say something. Sometimes, we would sit on a bench until it became as dark as it can be in summer. The enchantment fell with a crash when we came home and turned on the light. The tradition of the evening stroll comes from my Finnish grandmother, who called this dreamlike state ‘Nirvana’. I don’t know for sure if they used the ‘dusk’ in my father’s childhood home, as neither he or his mother are alive any longer. But something indicates that they did, because my father, a rational thinking economist, was there together with my mother while the darkness fell. Almost nothing was known of yoga – and meditation was something or other esoteric – a self-hypnosis or trance state that no-one was interested in. The twilight hour was a completely natural thing in my childhood. It didn’t even have a name, as it was just something one did because it was pleasant. Therefore, I believed that it was a kind of physical need to collect oneself a little at sunset, just like we yawn or stretch ourselves in the morning. I also believed that everybody did it if they had time. I regarded people that barged into the room where one sat and turned on a light shouting, ‘Heavens, are you sitting here in the dark?’, as both rude and disrespectful. In Indian music, specific ragas are dedicated to the time we call twilight, both in the morning and evening – before sunrise and at dusk, they are called sandhi prakash ragas. When the musician plays at that time of day, he chooses to present precisely these ragas, to support the twilight and awaken its atmosphere of silence and reflection. Anyone who has given themselves time to experience a twilight in silence and without electric light, knows that it is a special time and that the body and mind are attuned differently than at other times of the day. It is a simple experience, and experiences outweigh all theory. Nevertheless, we are as human beings, unsure and search for confirmation of our experiences, and therefore we study life’s phenomena whilst we carefully go forward through life. A little theory can also support the twilight hour; we could mention how light and dark influence people’s states, moods and bio-rhythms. During winter, when the days are short and there is very little light in the atmosphere, some people in the northern countries get winter depression. An effort is now made to cure these people, they are exposed to strong light for about an hour every day. They put on white clothes and sit in a hospital, in a strongly lit room with white walls. It is obvious that whilst it is day, and when it is light, we owe it to our organism to be in the light, to be active and experience the sun and the day. It is common sense to discover a therapy as the aforementioned. And it works. It is invaluable to those who, every day in the winter, can come out into the daylight and the sunshine. I am certain that the sun’s light at any time is more beneficial than the electric light we expose ourselves to, unfortunately both day and night, in our houses and our cities. But darkness also has its qualities. For instance, it is easier for most to sleep when it is dark. The darkness also influences us positively when we follow the daily and yearly rhythms. It has been shown in yoga that, when in Nada Yoga (the yoga of sound) you listen to the inner sounds, it is noticeably easier for a beginner to detect these sounds at midnight, when the sun is on the other side of the globe, than at any other time of the day. When the darkness is deepest, the greatest possible relaxation can happen. The brain’s state is influenced by light and dark, and therefore, we usually close our eyes to relax or meditate. But it does not just depend on the eyes. Medical research in the USA has proven that the body and the cranium are penetrated by light, which can contribute in affecting the general condition. Likewise, it is known (according to an article in the Danish “Ugeskrift for Læger”, a journal for doctors) that the pineal gland is light sensitive. This gland is found in the middle of the head and is connected with Ajna Chakra. Measuring the brain waves shows that a spontaneous relaxation occurs when we close our eyes – the brain’s state changes from beta to alpha waves. The twilight hour, with its increasing darkness, is naturally an ideal time to meditate. Also socially, being late in the afternoon, after the day’s activities and before the activities of the evening with family and friends – a moment in between, a time for calmness. There are meditations where one observes the darkness and realizes that even pitch darkness, which one normally “sees” with closed eyes in a dark room, is not at all dark, but that colour and light phenomena in the eyes, brain or mind can be perceived. Such a meditation is quite advanced and involves more than this; it is mentioned here just as a curiosity. One seeks, then, to learn the contents of the apparent darkness; thereafter, to move towards an even deeper darkness, till at last, there is nothing to “see”. It is a tantric technique that is built up in steps and should only be learnt and practiced in its most advanced stage when one is familiar with a fundamental meditation, such as Inner Silence (Antar Mauna). But there are also meditations where the eyes are kept open, and meditations where one alternates between having open and closed eyes. It is, naturally, a precondition that one sits in a dark room or a room with strongly subdued lighting. An instruction to a meditation with open eyes could sound like this: Sit upright, with open eyes and look at the floor about a meter in front of you. You do not stare at anything but just gaze relaxed in front of you. Neither do you look around for anything in the surroundings nor at anybody else that may be present, and you do not sit with closed eyes, caught by the activity of the mind; you look impartially in front of you. In this way, you are, to a lesser degree, preoccupied with anything inner or outer. I have heard from a good friend and old student in the USA (Kellie Williams) about her maternal grandmother, who grew up in a native American Indian community. Every day at dusk, before the late evening meal, she would sit still until it grew completely dark. And when the children asked her later what she did at that time, she would reply that she, “travelled to the spirits to listen”. Within yoga, we deal with, among other things, the body’s energy currents, and out of the 84,000 nadis or currents that are found in the body, the three that run through the back are the most important: ida nadi, pingala nadi and sushumna nadi. In brief, pingala nadi stands for the active and physical – the sun, ha; ida nadi for the mental side of our being – the moon,tha. Sushumna nadi is the central current in the back that the two others wind around, through all the chakras from muladhara chakra to ajna chakra, from where sushumna continues alone up to sahasrara chakra. When the other two energies are in balance, they combine and flow through sushumna. The hatha yogi aims for this balance. Ida and pingala also have connections with the two brain halves, therefore, we can say that in yoga, one aims for a better balance in the brain. About this subject, see: Lasting and deep reaching effects, and, The Source of Energy. A constant interplay takes place between the two currents and their effects on the organism, day and night. It happens in short cycles of an hour and twenty minutes where one current dominates, followed by a period where there is a balance, then the other energy is active for a similar length of time. Every time the two currents are equally strong and in balance, every time sushumna opens and energy flows through it, then is the best time for meditation. One can feel the breath in the nostrils by holding the back of the hand under the nose and ascertain which of the two energies is active. The sun nostril is the right and surya swara (the sun energy) can be felt here. The moon energy, chandra swara, can be detected when the left nostril is open. In this way, the one and then the other energy is active throughout the day. To observe and use this knowledge, and eventually influence these currents is called Swara Yoga. When both nostrils are equally open, sushumna swara flows. “The external sun and moon divide each twenty four hours into night and day, and the internal sun and moon, i.e. ida and pingala, are responsible for our perception of night and day, that is duality. Ida nadi predominates at night, the parasympathetic nervous system is active, there is a greater release of melatonin hormone within the brain and the subconscious mind is active. During the daylight hours pingala predominates, the sympathetic nervous system is more active and serotonin hormone is released within the brain which brings conscious functions to the fore and the subconscious mind submerges. The two nadis, ida and pingala, and the two nervous systems, pull the awareness from one extreme to the other, binding us to the duality of mundane circumstances because of the interconnection and interrelationship with the external force of the sun and moon. The entire biological system is programmed to the movements of the sun and moon cycles. However, a yogi can develop control of the autonomic nervous system so that the body and mind are not swayed to the extremes. It means developing the voluntary and central nervous systems, activating sushumna nadi and ajna chakra. Such a person lives in a perfectly balanced state of being. What did they do – or do they do – at dusk? “Be silent and you will see”, it is written in the Bible. From my experience, I would take this to mean, do not expect anything, do not imagine anything, but be receptive. By this, I do not mean that the twilight hour was, or is, a religious phenomenon, rather that it is an act of mental health – or quite simply something one does, because it is pleasurable and does one good. What kind of insight, or should we say experience, is reached whilst sitting there in the twilight alone or together with others? Naturally, this cannot be explained satisfactorily as the people and families who uphold the twilight hour are different, but I can give a few examples. The first step of the meditation technique Inner Silence consists of listening to the sounds in the surroundings – no sounds are left out and one does not pay attention to only one sound at a time – none are emphasised and none are avoided. The environment is experienced as a whole – one listens to all the sounds at the same time. What did we actually do, say the people I have asked, and there have been various suggestions: – nothing really – listen to the surroundings – let the thoughts flow by – experience the day again, with its events, feelings and thoughts. – Sometimes I forget myself in a dream, but return to the experience of the dusk and the silence. Finally, I would like to ask: Being still, inner and outer, is that not just the same as to be? And when we are, then we do not lose ourselves. “She rose and lit the lamp, and at that moment, as the room sprang forth in a clear golden light, our intimacy vanished. I sat at the table and finished a drawing of Martin Luther. It amused me to put shadows in the folds of the monk’s cowl and to make them arch out of the paper. The work absorbed me. I sweated and whistled and forgot that the lamp’s light had, in an incomprehensible way, caused me a new sorrow and had again estranged me from my mother. When I began asking my students about the twilight hour a few years ago, I grew more and more surprised at how close the experiences of different people, in relation to the twilight hour, are when compared to some of the steps that form the meditation Inner Silence. It has, once again, confirmed for me, that a real meditation is founded upon natural processes that the mind follows when it calms down and goes deep. They are processes common to us all, as people’s physiology and minds are essentially the same everywhere on the planet; but perhaps the daily and yearly cycles affect people differently who live closer to the two poles, as we do in the North. The influence Swami Satyananda talks of, that the sun and moon, or day and night, has on people, has a completely different rhythm up here compared to India. At the twilight hour, it is not about having special abilities or achieving something. There is no question of an everlasting therapy, where for the rest of eternity one should go backwards and relive one’s childhood, or stirring up emotions that one is not capable of evoking in natural life situations or that emerge by themselves in meditation to be relived there. On the contrary, it concerns a method – such as Inner Silence and to a certain degree, the twilight hour – that brings one closer to the essence of life, to the balance that at the same time is experienced as a wholeness in everything and as one’s own essential being – life itself and the consciousness behind life – the energy, nature and I, who experience it. And the very simplicity is the genuine, not to perform anything, or to strive after this or that experience. Here, it is a case of a naturalness and peace that even a child can understand – and for my part, they can keep the miracles – life itself and the everyday is, as I see it, the biggest miracle. By that, I do not mean that one cannot develop and deepen one’s meditation. Can we maintain a conscious and creative attitude to the changes that are happening in our culture? We have, with this article, described a tradition in Europe that has almost disappeared. In the future, we may investigate if other traces can be found in our culture of a more conscious inner life, maybe deeper and more developed practices that we can compare to that which we know from the living Tantric tradition. If so, we will present it here, in the Reading Room. The fate of the twilight hour, that it has just been forgotten, has presumably come about because it has been such a natural part of our everyday, that we were unconscious of its value and also the culture has gradually changed our habits in the course of two or three generations. When we try to rediscover these things, then it is done best through good instruction and guidance, so that we do not cheat ourselves by taking too little or too much into our heads. Where did that experience go that I had as a teenager when, on a warm, summer afternoon I drove with the horse rake to gather the hay; or when, late in the autumn I ploughed, while it grew dark, albeit with a tractor, but without cab and stereo. Or when, at dusk, I was bicycling to or from work between large fields, through small villages and woods with no street lights. It is at dusk that the animals move about and can be met by the road. A special twilight is at full moon, and especially at the equinox, spring or autumn, when the moon rises while the sun sets. This moment should be appreciated, both as an experience of unity in nature and for silence and meditation. “When I was a child in the early sixties, my mother gathered us children when it began to get dark, and we would keep the twilight hour. I enjoyed it very much. Then my mother would tell stories of her childhood in the countryside of Jutland, or she would sing quiet songs. After a while, as the darkness fell, the conversation would quieten and silence grew in the room – and in the body. The darkness felt almost material, it was like it wrapped itself softly around you, that was a very reassuring feeling and at the same time, it felt like being at one with the sitting room. So we just sat there and were completely still, which was otherwise difficult for three boys – but not when we had twilight. When it was completely dark, mother stood up, turned on the light and started to make the evening meal as father would be home soon. What I remember most of when we had twilight is the silence, the feeling of security and the red glow from the stove, as it was winter time when we kept twilight. But television soon came and forced its way in, and children’s television was on at that hour and the custom went out of use. But as an adult, I still practice twilight now and then and my mother cares very much for it, but otherwise I don’t know anyone who knows of this custom. Finally, a thank you to all who have contributed to this article with written and verbal material. 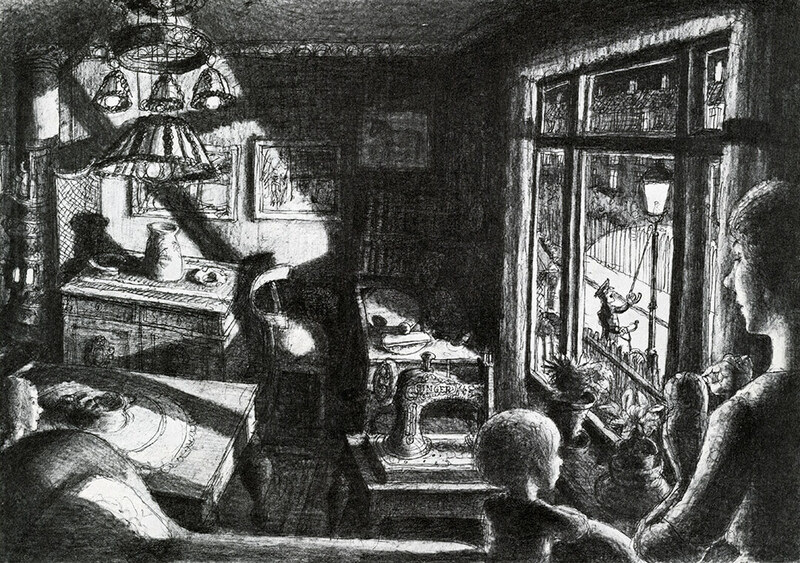 The pictures Dusk and The lamp lighter has lit and the accompanying texts are from the book “Little boy in Østerbro” by Ib Spang Olsen, Bogladerne Østerbro, Copenhagen. We thank you for permission to reproduce them.